A prestigious women's one-day race in Belgium was temporarily halted after breakaway leader Nicole Hanselmann almost caught the men's race. The Omloop Het Nieuwsblad race marks the start of the 'cobbled classics' season and is a UCI World Tour event. The men's race started 10 minutes before the women but Bigla Pro rider Hanselmann was catching the back of the men's support vehicles after 35km. Organisers "neutralised" the women's race to create a gap between the races. Swiss rider Hanselmann, who attacked after seven kilometres and had opened a lead of around two minutes, was stopped, allowing the peloton to catch her. When the 123km race from Gent to Ninove, which featured five cobbled sectors, was restarted, Hanselmann was allowed to build an advantage before the peloton was released. However, the former Swiss national champion was soon caught and eventually finished in 74th place, with Chantal Blaak taking the title that Britain's Lizzie Armitstead won in 2016. "Maybe the other women and me were too fast or the men too slow," joked Hanselmann on Instagram after the race. 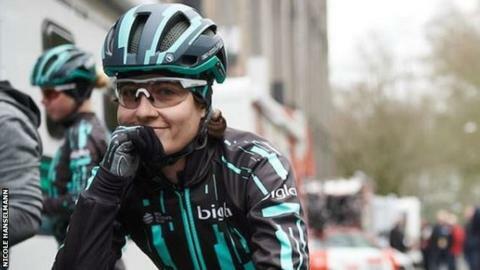 Speaking to Cycling News, she said: "We came too close to the men's so we had to get a neutral time gap again so it was a bit sad for me because I was in a good mood and when the bunch sees you stopping, they just get a new motivation to catch you. The men's race was won by Czech rider Zdenek Stybar. Ian Stannard, who won the race in 2014 and 2015, was the best placed British rider in 26th, almost two minutes adrift.